Hatters boss Nathan Jones heaped praise on his side after they defeated AFC Wimbledon 2-1 in the Checkatrade Trophy last night to finish top of the group. Although a draw would have been enough to ensure progression in the competition, Hatters produced a fine second half display to triumph, as Andrew Shinnie’s classy strike with 18 minutes to go sealed the win. Jones said: “I thought it was a real good game, credit to Wimbledon, they wanted to top the group, we wanted to top the group and I thought it was an excellent game, real competitive. “I’m really, really pleased as I thought first half was a really even contest, but second half I thought we were excellent, I really did and we had a couple of opportunities to score again. “I thought it was quite an even game, both teams treated it well. It was a proper game of football, two teams that want to win, two teams that are similar in level and I enjoyed watching it and enjoyed the test that my players got. It was a proper game of football, two teams that want to win, two teams that are similar in level and I enjoyed watching it and enjoyed the test that my players got. Hatters had taken the lead through Shinnie after just 12 minutes, only to be pegged back instantly, the dangerous Lyle Taylor on target. For once, Jones didn’t overly mind the fact they conceded as he preferred the challenge it gave his young centre half pairing of Akin Famewo and Frankie Musonda. He continued: “I’m disappointed but I’m also pleased as it tested us. “One it tested me tactically, two it tested our two young centre halves because we came up against Lyle Taylor, who’s let not forget, when we came here 18, 19 months ago, he terrorised our two first team centre halves. “So it was a real good test for them and they needed to get to grips with that. 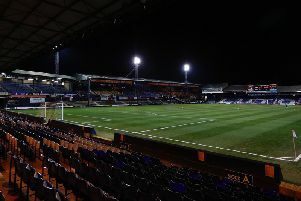 Jones had made 10 changes for the game, only keeping Glen Rea in the side from Saturday’s 3-0 defeat to Coventry City, naming the 23-year-old captain too. The side had an average age of 22, as on his selection, he said: “I think everyone’s up to speed now, people like Shinnie, Lawson (D’Ath), Pelly Ruddock (Mpanzu), who have missed out through injury or suspension. “I thought Glen Rea was immense tonight, he was captain, when he stepped back into the back three in the first half, he settled us down, steadied the ship a little bit. “There were some real, real good performances, JJ (James Justin), another 90 for him and they all got tested, which was a good thing. The victory now gives Town home advantage in the next stage, and saw them improve on their points tally from last season, aided by two bonus points picked up with penalty shoot out wins over Tottenham U21s and Barnet. Jones added: “It’s just treating the competition right, people make rules and if there’s a penalty shoot out to decide the game and get a bonus point then try and win it. “Because that meant going into tonight, we could have drawn the game and gone through, but the win just gives us that little bit more of an advantage. “Plus, Joaquin (Gomez) did the presentation and we said, we want to be further ahead of where we were last year in all aspects. “We had six points last year, we lost to Millwall in the final game, so it was a similar kind of test we came up against, and we topped the group. “Our group has been a real good group. The game against Barnet was a real competitive game, the game against Tottenham was too, so credit to all of them. “We’re just pleased to have gone through and to get home advantage, it does help in this competition because the last thing you want to do is add a big journey and an overnight stay as it really does disrupt your week in terms of preparation, not just for the league game on the Saturday.